What is driving Cloud adoption? What is Cloud? Discover the TCO and ROI calculations to demonstrate the cost savings that can be achieved by moving to the Cloud, including a run through of these across three different sizes and types of organisations along with the green benefits that Cloud delivers above traditional virtualization. 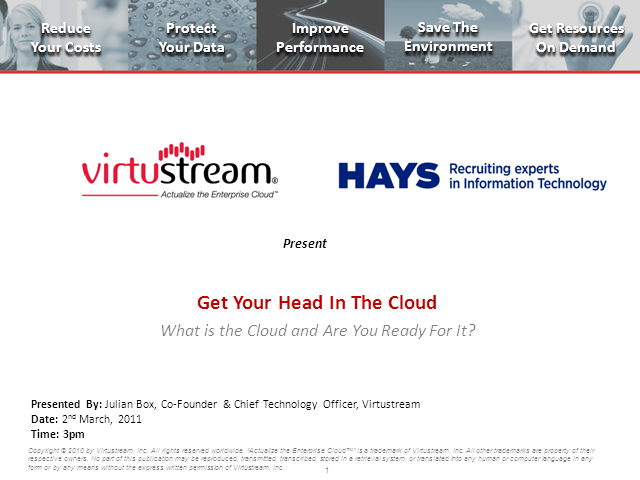 This will be presented by Julian Box, CTO, Virtustream, whose experience includes ten years of delivering strategic-based virtualization solutions, operational readiness and dynamic and agile solutions/thought leadership for tomorrow’s needs. Tune in and you'll be able to learn why you should be considering a Cloud Strategy for your organization.